Finally, my thoughts about books 2 and 3 which I read for the RIP Challenge! I had chosen the easy route this year – reading two books (Peril the Second, as it’s called). But…I ended up reading three! The first book was The Story of Edgar Sawtelle and I wrote about it here. The second book was The Gargoyle by Andrew Davidson (published 2008, fiction, 480 pages, ISBN-10: 0385524943 & ISBN-13: 978-0385524940). Wow! And I mean that in the most amazed sense of the word! This book has become one of my favorites and it has a little something for everyone! Interested in Japan? Lots about Japan here and a spooky story as well. Iceland and Vikings? Ditto. Medieval Italy? This book’s for you! Long ago England & Germany? Read it! Like love stories? It’s really what this book is all about…love. Intense, passionate, captivating…what are you waiting for! Go get this and read, read, read! I promise you won’t be disappointed! I started this the day after finishing The Gargoyle (needed some time to digest that one first) and I couldn’t put it down once I started!!! I was so drawn to the character of Silas, of course, who became Bod’s caretaker…and I also loved the witch. I was thrilled to finally fall in love with a Gaiman book, since Carl raves about them so much (even though he won’t return the favor and read a Harry Potter book, but whatevs). Thanks, Carl, for this challenge, and for turning me on to this book, which will take a honored place on my bookshelf! OH!!! And I just found out Black Phoenix Alchemy Lab has done a perfume series based on The Graveyard Book! Check it out!!! Woah. Have you ordered any of the scents yet? LOL! OK, now I’m going to have to read that book. I have a copy of The Gargoyle waiting for me in Canada, I can’t wait to read it! 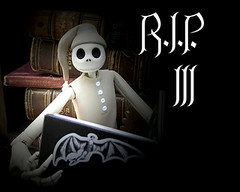 And I just got a copy of The Graveyard Book. I’m totally in love with Neil Gaiman’s books. I even consider reading his graphic novels, if I ever get my hands on some of them. 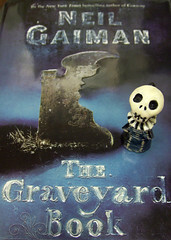 Didn’t get a chance to read The Graveyard Book yet, but I am sure I will love it. Try Neverwhere – that one is absolutely fantastic as well. And this Gargoyle does sound interesting, too. Looks like another addition to my wishlist. Thanks. Exactly what I needed. It’s good to share books with friends. Neverwhere is my favorite Neil Gaiman book. How cool is that!? Thanks for the recommendations!